the "grammar" of proteins can be investigated using tools borrowed from linguistics — Lijia Yu et al. A new study focuses on protein domains. Researchers from the University of Alabama in Birmingham and the National Institutes of Health take these domains as the basic units of meaning in genomes, comparable to words in a language. They demonstrate that protein domains and words occur with mathematically similar patterns and frequencies, apparently following similar grammars. We welcome the affirmation that genomes, like languages, follow grammatical rules. This similarity resonates with cosmic ancestry, because it suggests a tool for the toolkit that we think life's evolution needs. Consider an analogy we have offered before: word-processing programs can identify spelling and gramatical errors, and suggest or make corrections. Even if some passages or pages are out of order, the error-correcting logic could be deployed to properly order them. Now consider genomes. Suppose some protein domains, typically a hundred to a thousand nucleotides long, are out of place. If genomes have an analogous capability, they could properly order the domains. The new study strengthens our view that genomes could have such capabilities. All life forms possess many multidomain proteins, but both the number of unique domains and the fraction of multidomain proteins increase with the organismal complexity (defined as the number of unique cell types in an organism): Eukaryotes have more multidomain proteins than prokaryotes, and animals have more multidomain proteins than unicellular eukaryotes. This trend of increased multidomain protein formation with increasing organismal complexity is known as domain accretion and apparently plays a major role in evolution, particularly in major evolutionary transitions such as the origin of multicellularity. Grammar of protein domain architectures by Lijia Yu et al., doi:10.1073/pnas.1814684116, PNAS, 26 Feb 2019. 14 Jun 2016: more software management. Robust Software Management... is a related (incomplete) page. The Second Law... explains why entropy is a confusing term. Potentially, interstellar meteors could deliver life from another planetary system and mediate panspermia. Discovery of a Meteor of Interstellar Origin by Amir Siraj and Abraham Loeb, arXiv:1904.07224v1, 15 Apr 2019. Interstellar object hit Earth and it could explain how life began by Sean Martin, Express.co.uk, 17 Apr 2019. 08 Feb 2018 & 15 Oct 2018: more from Loeb et al.. Thanks, Google Alerts and Justin Willingham. Another Mars meteorite may carry traces past life, namely the partially-melted remains of iron-oxidizing bacteria. The structures require interpretation, but the observed carbon isotope anomaly usually comes from life, on Earth anyway. Mineralized biosignatures in ALH-77005 Shergottite - Clues to Martian Life? by Ildikó Gyollai et al., doi:10.1515/astro-2019-0002, De Gruyter, Jan 2019; and commentary, MarsDaily, 05 Apr 2019. Thanks, Ronnie McGhee. Life on Mars! has lots about ALH84001. No detection of methane on Mars from early ExoMars Trace Gas Orbiter observations by Oleg Korablev et al., Nature, 10 Apr 2019. ...Why Hasn't a New Spacecraft Found It? by Kenneth Chang, The New York Times, 10 Apr 2019. Microbes in the human body swap genes, even across tissue boundaries, UIUC (+ Physorg.com), 11 Apr 2019. Horizontal gene transfer in human-associated microorganisms inferred by phylogenetic reconstruction and reconciliation by Hyeonsoo Jeong et al., doi:10.1371/journal.pgen.1007995, Nature Scientific Reports, 11 Apr 2019. The modern Synthesis ... is a correct theory but only for a narrow range of evolutionary processes in certain groups of oranisms — Eugene Koonin, 2017, quoted in Darwin Overthrown: Hello Mechanobiology, by Suzan Mazur, Caswell Books, 2019. 09 Apr 2019: our unfiltered comments to Mazur about the book. Helpful genetic mutations can be induced by environmental stress, and they often occur just where needed. To be installed, the mutations require complex DNA repair mechanisms depending on many genes. In addition to nucleotide substitutions, insertions or deletions, Environmental stress up-regulates the activity of mobile DNA elements in many organisms, and this inducible genome instability is likely to be an important driver of evolution. These observations come in an open-access article by molecular geneticists Devon M. Fitzgerald and Susan M. Rosenberg of Baylor College of Medicine. The authors focus on bacteria and yeast cells, but Stress response–up-regulated mutation mechanisms have been discovered in plants, flies, and human cells. Edited by W. Ford Doolittle, the article concludes, regulated mutagenesis mechanisms greatly increase the probability that the useful mutations will occur at the right time, thus increasing an organism's ability to evolve and, possibly, in the right places. Assumptions about the constant, gradual, clock-like, and environmentally blind nature of mutation are ready for retirement..
We agree, rearrangements within an existing genome can have profound effects, both positive and negative. For a positive one, suppose that a silent beneficial gene needs only to be turned on, or a key exon needs relocation. If this change is inherited, a beneficial evolutionary step is enabled. But if the gene or exon is not available, stress alone cannot induce that evolutionary step. To restate this, we think there is a near limit to the range of evolution within a quarantined genome. Suppose an evolutionary step requires a unique strand of, say, 200 or more properly sequenced nucleotides. If the strand is not already present, the evolutionary step will not occur. Of course, HGT could supply it. But without HGT, macroevolutionary progress would not continue, we believe. We scan the literature regularly for relevant evidence, and HGT is obseved frequently enough, in all domains. Also, we have proposed research programs in biology and in computer models to test this contention, with no serious takers. Meanwhile, we welcome these observations from Fitzgerald and Rosenberg. 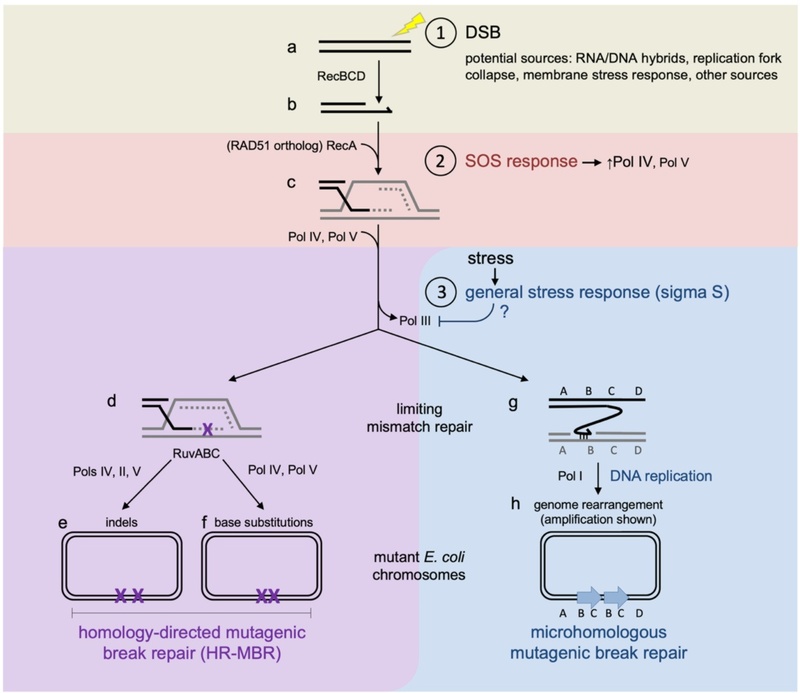 These mechanisms reveal a picture of highly regulated mutagenesis, up-regulated temporally by stress responses and activated when cells/organisms are maladapted to their environments—when stressed—potentially accelerating adaptation. Mutation is also nonrandom in genomic space, with multiple simultaneous mutations falling in local clusters, which may allow concerted evolution—the multiple changes needed to adapt protein functions and protein machines encoded by linked genes. What is mutation? A chapter in the series: How microbes "jeopardize" the modern synthesis by Devon M. Fitzgerald and Susan M. Rosenberg, doi:10.1371/journal.pgen.1007995, PLoS Genet., 01 Apr 2019. New genetic programs... describes a rudimentary test. The Evolution Prize... was an advertised test that flopped. Is Evolutionary Progress ...Possible? has discussion and updates about a long-running quarantined experiment. Macroevolutionary Progress Redefined: Can It Happen Without Gene Transfer? has related discussion. Viruses... is our main webpage about HGT. 2018 2017 2016 2015 2003: various examples of stress-induced or non-randonm HGT. The Second Law of Thermodynamics makes our argument logically. Robust Software Management... is incomplete. The Beginning and Evolution vs Creationism mention questions asking, "...in the first place?" Independent confirmation of a methane spike on Mars and a source region east of Gale Crater, by Marco Giuranna et al., Nature Geoscience, Apr 2019. Thanks, Sky & Telescope. Life on Mars! has more about methane there. On Earth biological sources ...produce 95% of the methane in our atmosphere. D. geothermalis remained viable in the desiccated state, being able to survive space and Mars-like conditions and tolerating high extraterrestrial UV radiation for more than 2 years. Tolerances of Deinococcus geothermalis Biofilms and Planktonic Cells Exposed to Space and Simulated Martian Conditions in Low Earth Orbit..., by Corinna Panitz et al., Astrobiology, online 29 Mar 2019. Bacteria... has related information.